PLÉHOUSE ANNOUNCES ITS FOURTH SKI RELEASE &quot;SKIMATIC&quot;. Pléhouse is proud to announce the release of &quot;Skimatic&quot;, the ski machine. “Skimatic,” the eagerly anticipated follow up to Pléhouse’s 2005 film “White Shine”, takes an easygoing and humoristic approach by combining breathtaking ski footage and radical motion graphics. Shot on location in Lebanon, France, Japan, the USA and Canada “Skimatic” will feature the top athletes of the freeskiing world such as Phil Belanger, Phil Larose, Charles Gagniers, JF Houle, Josh Bibby, Woodie Bouma, Thomas Rinfret, Frank Raymond, Alexis Godbout and Laurent Favre. “Skimatic” will premiere in September and will be released to core shops on August 29th. 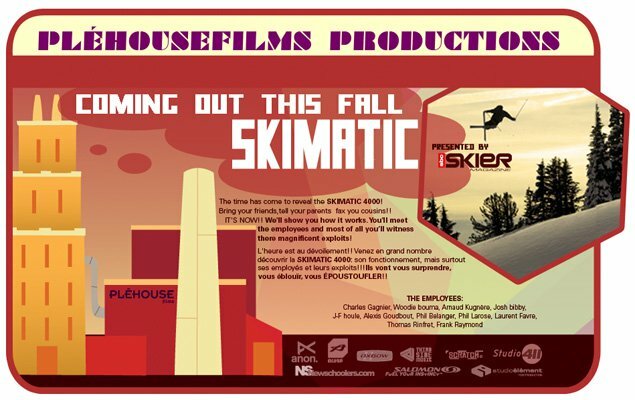 Check out http://www.plehousefilms.com to catch the 'Skimatic' teaser and latest Pléhouse news.“Skimatic” is one ski film you won’t want to miss! Pléhouse est fière de dévoiler sa nouvelle machine “Skimatic”. Cette année, Pléhouse adopte une approche plus légère et humoristique en alliant images puissantes et animations débridées. Visitez notre tout nouveau site à http://www.plehousefilms.com pour voir labande annonce Skimatic.Disponible dès cet automne.